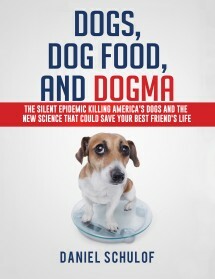 First of all, if you’re at all interested in this topic, you really ought to check out Dogs, Dog Food, and Dogma, my book about the science (and business) of canine health and obesity. If you don’t think it’s the most honest, rigorous, in-depth, and all-around helpful book you’ve ever read on the topic, I’ll refund 100% of your purchase price, no questions asked. Get one. Your dog will thank you for it. If you’ve shared your home with dogs for any meaningful period of time then the chances are good that canine cancer has already touched your life. According to the National Canine Cancer Foundation, one in three dogs in America will be affected by some form of cancer. And half of those animals will be killed by it. In fact, cancer is the leading cause of death in dogs over two years of age. Cancer is so widespread in American dogs that there is only one other modern canine health epidemic that can truly rival it for significance. And that, of course, is obesity. It’s no coincidence that these two phenomena compete for the unholy distinction of America’s Worst Doggie Health Problem. As no one reading this article needs to be told, there is a well-publicized statistical “link” between cancer and obesity. Where we find one, we tend to see the other. But what’s not well understood — either by laypeople or by a consensus of research scientists — is why the two are linked. At a cellular level, exactly what is it that makes obesity and cancer so likely to show up together? But for others the devil is in the details. The folks in this second camp argue that understanding the biochemical nuts and bolts of the cancer-obesity link will help us make the most appropriate lifestyle and disease-treatment choices for our dogs. That it’ll form the foundation for further cancer treatment research. Plus we’re just naturally curious — we want to understand simply for understanding’s sake. This article is for those of us in the second group. Fundamentally, researchers have come up with two competing theories to explain the cancer-obesity link. They are not mutually exclusive. The first (which I’ll call the “adipokine model”) suggests that obesity causes some forms of cancer because some of the inflammatory adipokines secreted by body fat lead to somatic mutations or otherwise promote tumor growth. You remember adipokines, right? They’re the hormones and other secretions that fat cells actively release in order to “communicate” with other body parts. Well, the adipokine model says that the more fat your dog has in its body, the greater the concentration of pro-inflammatory adipokines in the bloodstream becomes, and the more that genetic mutations and tumor growth are stimulated. Here are a few studies that attempt to tease out the biochemical underpinnings of the adipokine model. Two general things to note: (1) much of the research in this domain has to do with breast cancer, which happens to be the most common form of cancer in female dogs; and (2) there are lots and lots of different adipokines and lots and lots of different kinds of cancers — so we’re still a long, long ways off from understanding all of the ways that various adipokines promote (or, in some cases, inhibit) somatic mutation and tumor growth. The second explanation for the cancer-obesity link (which I’ll call the “metabolic model”) dates back to the 1920s, but is currently enjoying a renaissance. It is a truly sweeping theory with remarkable implications for how we should treat our dogs if we want to minimize their cancer risks. It’s gaining traction with many leading cancer researchers and it is the basis for over a dozen clinical trials that are currently underway. Every living cell in a body needs chemical energy in order to function. And the process through which cells manufacture the energy that they use is called metabolism. Like humans, dogs can metabolize chemical energy from a number of different biochemical sources (via different “metabolic pathways”), including glucose, fatty acids, and ketone bodies. Which source any individual cell utilizes depends on factors like the cell’s role within the body, the relative availability of the various fuel sources, and the availability of oxygen in the body. So, by tweaking our dogs’ diets and daily activities, we can control the extent to which their healthy cells rely upon glucose for energy (as opposed to other fuel sources like fatty acids and ketone bodies). But cancer cells are different. Unlike most healthy cells, regardless of the availability of oxygen and regardless of the availability of other metabolic fuel sources, many kinds of cancer cells must rely exclusively on glucose to fuel the dizzying pace with which they proliferate. Cancer cells multiply quickly and uncontrollably, and the only way they can keep it up is with a ready supply of a hot-burning, high-octane metabolic fuel source. And there’s only one such fuel source — glucose. So what does this unique metabolic quirk have to do with canine obesity? Well, blood glucose also plays a central role in bringing about obesity. Specifically, when dogs (and other mammals) ingest carbohydrates, those carbs get converted into glucose and spat out into bloodstream. And the infusion of glucose into the bloodstream is the first step in the primary biochemical chain of events that leads to fat growth. Which is why carbs, not dietary fats, are primarily responsible for making our dogs fat. In other words, while the adipokine model suggests that body fat plays a role in causing cancer, the metabolic model suggests that both cancer and fat-growth are consequences of excessive carbohydrate intake. The implications of the metabolic model of cancer are pretty dramatic. They suggest that we may be able to protect against and treat cancers simply by carefully controlling for carbohydrate intake. That we can “starve” cancer cells by denying them access to the fuel source that they need in order to multiply. Now, for those of you who’d like to travel further down the rabbit hole, there are some great links at the end of this article. I encourage everyone to read them critically and think for yourselves about the extent to which the evidence supporting the metabolic model of cancer is persuasive to you. As an avowed carbo-phobe I may be biased, but I must confess that it looks pretty convincing to me. Although wolves consume zero carbohydrate (and experience precisely zero obesity), and although dogs do not require carbohydrates in their diets, carbohydrate consumption is deeply ingrained in modern mainstream dog-ownership — according to the NRC, almost all kibble-ized dog food products are made of 50-75% carbohydrates; dog “treats” are crammed with simple carbohydrates and starches; and most mainstream pet health and wellness authorities continue to recommend a diet infused with “healthy” grains. 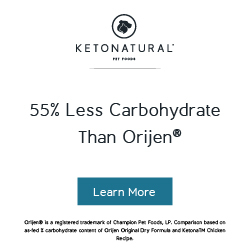 And if we look at this carb-obsessed world through the lense of the metabolic model of cancer, then all of a sudden the canine cancer epidemic and the canine obesity epidemic start to make an awful lot of sense. Okay, that’s it for today. Hopefully this little post will propel you towards gaining a deeper understanding of the links between canine cancer and canine obesity. Have a great weekend, y’all. I’m off to catch some dock-diving at the International Sportsman’s Expo. Recommended Reading Rabbit Hole links are below. — This 1,000-word essay from Peter Attia, M.D. Dr. Attia is the President of the Nutrition Science Initiative. His essay features links to loads of other great online reading on this topic. — This long-form article from Travis Christofferson. Travis does an amazing job of creating a succinct, readable summary of why the metabolic model of cancer is so compelling. Highly recommended. — For the truly adventurous, this textbook from Boston College’s Dr. Thomas Seyfried. Dr. Seyfried is the world’s foremost authority on the metabolic model of cancer. If you want primary sources and raw data, this is your best bet. — Any effort to understand cancer would be incomplete without a reading of Siddhartha Mukherjee’s extraordinary Pulitzer Prize-winner, The Emperor of All Maladies. It’s an absolutely incredible book. Although, as discussed in the Christofferson piece, it is notable for its failure to discuss Dr. Seyfried’s research. Having been a long-term Gary Taubes fan, I read your book recently and was gratified to see many Taubesian quotes. I think the situation is even worse for cats, since unlike dogs they are obligate carnivores, but most get fed grain-heavy dry food. My last cat was obese and had only three teeth left after a life of Meow Mix. My current cat is not given *any* kibble. Have you seen this? “Health mutt: proposal to put shelter dogs on vegan diet divides Los Angeles”. Yikes.